The meet’s been a tough go for Kent Desormeaux. “The Kid” rode well but the facts don’t show it. His acknowledgement that he had a drinking problem came on the first day. Breaking a bone in his neck when a horse had a heart attack was the way it all finished. In the fourth race, Cornelio Velasquez rode a winner that the Hall of Fame jockey was listed on. Longshot Tocco d'Oro keyed a $240.00 exacta, holding a comfortable advantage throughout a 1-1/16 mile $25,000 claiming race on the Mellon Turf Course. Before Tocco d’Oro, Linda Rice - the queen of turf sprints - threw four starters at Todd Pletcher's 3-5 Rose Catherine in the 5-1/2 furlong opener. But the best she could do was to show. The first race was the $70,000 Lena Spencer Stakes. Its namesake co-founded and owned Caffé Lena, the 50-year-old coffeehouse on Phila St. where Bob Dylan, Arlo Guthrie and Don Maclean played. Pletcher scored with a second short-priced horse to sweep the Daily Double. The two-year-old colt Crea's Law, a colt that lost to Hysterical Cat last time out, broke his maiden by beating D'Sauvage. The neck margin epitomized the competition between two master craftsmen. Velazquez beat Javier Castellano in the photo. In between the second and the ninth races, the action intensified. Souper Spectacular, a three-year-old half-brother to Zenyatta, broke his maiden. Astrology, a two-year-old A.P. Indy colt from Stonestreet, confirmed that he had star power. Don’t Fooli Houli keyed an $89,584.00 superfecta. C.S. Silk won the Addison Mallery. Then, just as Big Drama looked poised to win the $250,000 Gr.1 Forego, Alex Solis booted Here Comes Ben home to an upset. It was only the second win of the meet for Solis, an unbelievably low total for a jockey that’s been touted for the Hall of Fame. Solis is among several horse racing luminaries, including Calvin Borel, Nick Zito, Gary Contessa, Christophe Clement and Wesley Ward that have underperformed at the Spa. Lastly, Quality Road can be Horse of the Year if he wins the Breeders’ Cup Classic. That’s the sentiment expressed by his trainer after the 57th running of the Gr.1 $750,000 Woodward. As expected, the favorite redeemed himself from his head loss to Blame in the Whitney. Mine That Bird ran forwardly but faltered. Pletcher’s not trained a Horse of the Year before. There are signs that another Saratoga tradition, like the saddling of horses under trees or the painting of the winner’s circle in chalk on the racetrack, is about to end. Officials have removed the hanging plants from the Carousel Restaurant, thus preventing patrons from stealing them. On the last day of racing in recent summers, “the filching of the ferns,” as the tradition has come to be called, resulted in streams of people filtering out of the racecourse like guests leaving a wedding reception with centerpieces. Never again, say the new bouncers in lime green polo shirts. 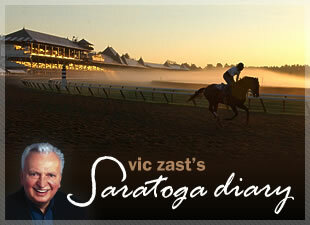 Vic Zast has attended at least one day of racing at Saratoga in each of the past 47 years. He writes a Monday morning column for HorseRaceInsider.com.